Over the past decade, bee populations have been decreasing significantly in North America. While many studies have investigated why there has been a decrease, few have researched the long-term change in species richness, in interaction between pollinators and plants, or in function of pollinators. Burkle et al. (2013) studied the loss of species of plant-pollinators, focusing on bees, and forbs, their interactions, and the function of bees over 120 years. Using data collected by Charles Robertson from 1888 to 1891 and data collected in 2009 and 2010 from natural habitats near Carlinville, Illinois, USA, the authors quantified and analyzed the changes in the network structure, bee diversity, and phenologies of bees and forbs. Additionally, data from 1971 to 1972 in Carlinville were used to investigate the changes in bee diversity, quality of pollination, and bee visitation rates to Claytonica virginica. Over 120 years, a substantial number of species interactions and bee species were lost and bee phenologies shifted significantly. The authors found that richness of bee species and the rate of visitation to C. virginica declined dramatically in the last 40 years and that there was a loss of redundancy in bee species. In order to analyze the changes in network structure and phenologoies of pollinators and forbs, Burkle et al. sampled plant-pollinator interactions and their phenologies in woodlands that were within ten miles of Carlinville during March through May of 2009 and 2010. Twenty-six spring-blooming forb species and 109 pollinating bee species were observed during the peak time of 9:00 to 15:00. The authors then calculated the number of interactions lost and gained between the 1890s and 2009/ 2010. Additionally, to test for the diversity of visitors and the quality of the pollination, the authors used a second historical data set from 1971 from the same fields visited in 2009/2010. To account for possible sampling differences, the authors used their sampling effort to extrapolate and found their sampling to be close to the “true” richness. Robertson, however, sampled only 13 of the 26 forbs observed in the current study, so the loss of species and interactions and loss of bee diversity is a conservative estimate. Burkle et al. also created a null model that used real data and examined the range of possible shifts in bee phenology in order to find how the phenological shifts of bees and forbs contributed to bee extirpation and interaction losses. Burkle et al. found that the overall network structure changed significantly from the late 1880s to 2009/2010. While only 24% of the original interactions were still intact, there were over 100 new interactions between forbs and bees, so only 46% of total interactions were lost. One major contribution to the loss of interactions were bee extirpations, which accounted for 45% of lost interactions (no forbs were lost). More specialists were lost than generalists, possibly because of a higher sensitivity to changes in resources and temperature over time and lower abundance in the 1890s. Parasitic and cavity-nesting species were also lost more significantly than other species, which could be due to decrease of available woody debris and changes in trophic levels. Moreover, 41% of the lost interactions that were a result of bee extirpations were connected to the lack of spatial co-occurrence and/or temporal co-occurrence. From examining the phenologies of forbs and bees, the authors observed that the peak forb bloom was 9.5 days earlier and the peak bee activity was 11 days earlier. While the phenologies of forb species that peaked earlier versus later in the season did not change, the phenologies of bee species that were active earliest changed the most. The null model showed phenological shifts only could account for up to 55% and 44% of that bee extirpations and loss of interactions. Additionally, the comparision of pollinator diversity and pollination quality between the 1880s, 1971, and 2009/2010 found that the richness of bee species did not change for the first 90 years, but decreased by over half in the past 40 years. 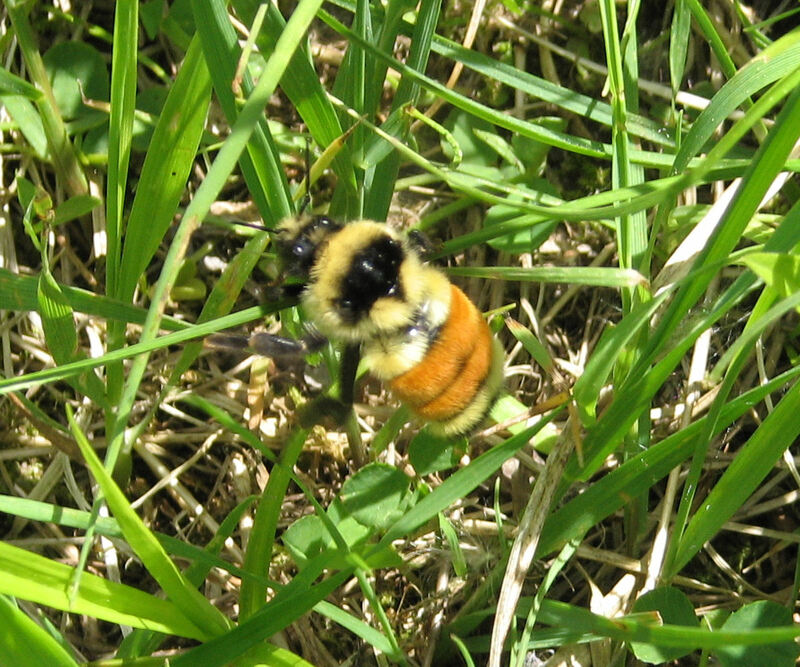 Bee visitation to C. virginica was four times as high in 1971 as 2009/2010. Bee communities were less intact in 2009/2010 than in 1971, as indicated by a change in significant nesting, in the ecological network sense, of bee species. Overall, the quality and quantity of bee pollination of C. virginca declined dramatically in the last 40 years. While there have been major losses in species interactions, bee species, and pollination service, the increase in different species interactions and the significant phenological shifts reveal a possible resilience to total species lost. However, the considerable loss of specialist bees and the quality and quantity of pollinator service suggest a continued loss of efficient, abundant, and diverse pollinators. This entry was posted in Lia Metzger, Pollination, Species Shifts and tagged bee pollination, Climate change, global warming, John C. Marlin, Laura A. Burkle, Montana State University, native bees, plant-pollinator interations, specie loss, species diversity, Tiffany M. Knight, University of Illinois, Washington University by Emil Morhardt. Bookmark the permalink.